Civil Engineering: Basic Principle for the Seismic design of Buildings: No significant additional cost thanks to modern methods! 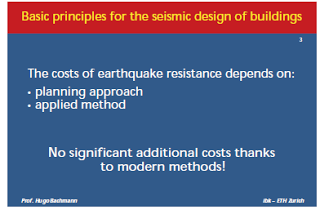 Basic Principle for the Seismic design of Buildings: No significant additional cost thanks to modern methods! No significant additional cost thanks to modern methods! Seismic provision must be taken into consideration in the architectural design of the building as well as in conceptual design of the structure. Above all, Substantial extra costs may be incurred if modification and additions to the structure need to be made at an advanced stage, since they often require modification of the architectural design also. drastic reduction in the seismic design forces at ultimate limit state. prevention of damage for earthquake up to a chosen intensity.